Since our inception, Micron remains dedicated to providing cost-effective and efficient sprayers designed to increase productivity and enhance customers’ operations. To ensure we continue to deliver value-adding equipment, we invest heavily in market research and new product development. All of our products are designed in line with our firm commitment to operator safety and protection of the environment. Our first-class products are sold in over 100 countries worldwide and fully backed by our experienced staff and distributor network. Fully trained and supported by our staff, we have representatives in most countries who provide technical expertise and after-sales service. Testament to our commitment to continuously improve our products and services, our UK-based staff regularly travel to give training and obtain first-hand user feedback for further product development. 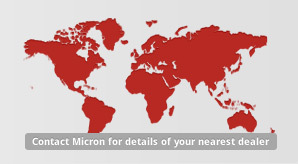 Demonstrating our dedication to product excellence, Micron holds ISO 9001:2008 standard and has been awarded a number of prestigious Awards.